In August, TechyDad and I went to BlogHer in NYC. While there, we had time to go to the Expo Hall to connect with some amazing companies. One booth that intrigued us was Pressman Toys. The area was set up with their items on display. Betsy, their PR representative, came over and talked with us for quite a while. She introduced us to their products and showed us the revamped version of Mastermind Game and Animal Mastermind Towers (Review and Giveaway coming soon for this). TechyDad and I were immediately interested in them since our oldest son, NHL 7, loved items like this. A short time after BlogHer, we received both of the games to review. They came just before a big family reunion for my grandmother’s birthday. I packed up the games and took them with us for everyone to play. 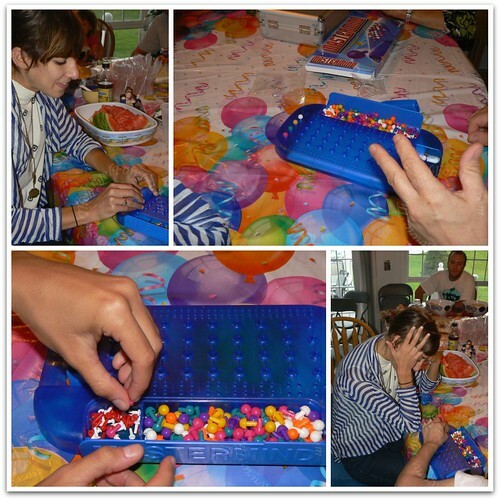 Here are some photos of my cousin J and Aunt A playing Mastermind. They were quite competitive and tried to make it even more difficult as they got going. Will you play the part of the codemaker, or the codebreaker? In the classic edition of our MASTERMIND game, the codemaker chooses from six different colors and sets a code of four colored pegs, which are concealed behind a flip-up shield. The codebreaker’s task is to replicate the code in ten moves or less. With each of the codebreaker’s attempts, the codemaker gives clues about the pegs’ color and position. There are more than 2,000 possible code combinations, making every round of this codebreaker logic game an exciting, brain-bending adventure! For 2 Players. Ages 8 to adult. The Classic Edition of Mastermind retails for $15.00. 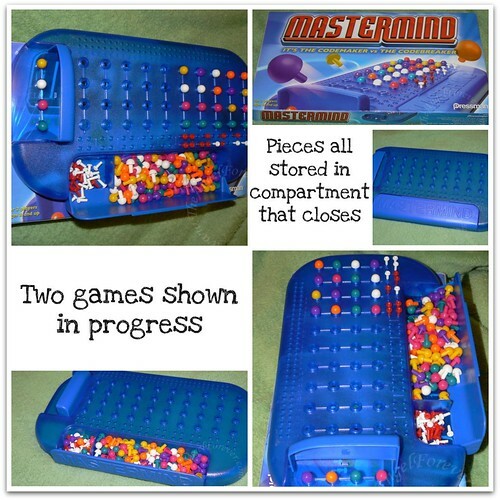 There are also other versions of the game available including Advanced Mastermind, Ultimate Mastermind, Mastermind Travel Edition, Mastermind for Kids, Disney Mastermind Towers, and more. TechyDad and I love games that make you think. 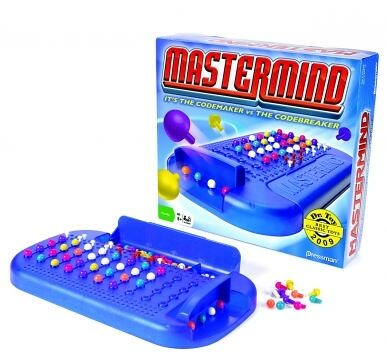 Before we had our kids, we used to have game nights playing games similar to Mastermind. After taking Mastermind to the lake to use with family, TechyDad and I also tried it out on our own. The first item that I noticed was the compact case that holds all of the pieces. All of the colored pegs are within a storage compartment that keeps them secure. There was no need for an annoying plastic bag to hold them or worries about pegs flying all over the place. In addition to this, the board itself is small and easy to store. When space is limited, this game is perfect to take along, or tuck away. Game play was a lot of fun. It makes you competitive not only as the codebreaker, but also the codemaker. When you are the codemaker, you have to be able to use the smaller red and white pegs seen above to give hints to the codebreaker about their guess. It was not difficult to figure out how to use these clues and fun challenge to use them to break the code faster each time. TechyDad and I have said we would like to try this game with our 7-year-old one day soon. We think NHL would really enjoy it and is probably ready to try the deductive reasoning skills. We have also said we may step it up a notch and try repeating colors in our codes for an extra challenge. I highly recommend this game. It will keep you on your toes, make you think/use logic skills, and have a good time. This would make a great gift for anyone for Chanukah, Christmas, or a Birthday. I even think it would be a fantastic item to donate to a teacher for a classroom (the inner teacher in me talking here). Teachers are always looking for educational games to have on hand for students when there is a little bit of down time in the day. Thanks to Pressman, one lucky winner will receive their own Mastermind Classic Edition to play. MAIN RULE – Tell me what your favorite board game is and why. 1 Bonus Entry – Who will you play Mastermind with and do you want to be the codemaker or breaker first? 1 Bonus Entry – Leave a comment on any of my non-giveaway posts from the month of October/November. Leave a comment here to let me know which one. This Bonus entry may be done three times per person. To enter, please follow the rules above within the comment section. Contest starts today November 4 and ends at 10:59 EST on November 18, 2010. You do not have to be a blogger to enter, but must leave a valid e-mail address for me to contact you for mailing address once the giveaway is over. I will select the winner using random.org and contact you via e-mail. You will have 48 hours to claim the prize. If there is no response, another winner will be selected. Open to U.S. residents only. Disclosure: This review and giveaway was made possible by Pressman Toys and their PR company. They provided me with Mastermind Classic Edition to facilitate this review. The opinions of this review are mine and I received no other compensation. My favorite board game is Trivial Pursuit (the original edition is still the best one), but I love all sorts of board games! My favorite board game is Apples to Apples. It is really fun in a big group. I would play this with my boyfriend and I’d want to be the breaker first. I would bring this to the Holiday parties, but I want to play my nephew first and be the code maker. My favorite board game is Monopoly. But now we really like these 5-minute card games, like Scrabble Snap, which are fun, portable, and quick to play. Favorite boardgame – Monopoly! Its a game I grew up playing and taught my son who is 18 and has played most of his life. Its fun to pretend to be Donald Trump and own everything. I left a comment on your “Thought of Florida” post. My favorite game is Sorry I liked that game when I was a kid and still like playing it today! I would bring this game on one of our summer vacations trip and most likely would play againist my mom, I would probably be the code maker first. I don’t know if it counts as a board game however we LOVE Phase 10! As of late we’ve been playing Discovery Garden most everyday! I want to play with my 10-year old grandson and I want to be the code maker…and then take a turn at cracking the code!! My fav board game is Clue. I love trying to figure out who did it, where and with what. Lots of fun! I would play Mastermind with my husband and best friend. I would love to be the code breaker first! Thank you to everyone that entered the Mastermind Game giveaway. Entries are now closed. The winner will be notifed shortly and be added to the Giveaway Winner page above.